Beautiful engraved RARE specimen certificate from the E.I. Du Pont De Nemours & Company dated in 1976. This historic document was printed by American Bank Note Company and has an ornate border around it with a vignette of an old country home. This item has the printed signatures of the Company's Chairman and Treasurer and is over 31 years old. 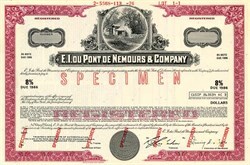 E. I. du Pont de Nemours and Company (NYSE: DDPRA, NYSE: DDPRB, NYSE: DD) was founded in July 1802 as a gun powder mill by Eleuth�re Ir�n�e du Pont on Brandywine Creek, near Wilmington, Delaware, USA. DuPont is currently the world's second largest chemical company (behind BASF) in terms of market capitalization and third (behind BASF and Dow Chemical) in revenue. It is also a component of the Dow Jones Industrial Average. In the twentieth century, DuPont led the polymer revolution by developing many highly successful materials such as Vespel, neoprene, nylon, Corian, Teflon, Mylar, Kevlar, M5 fiber, Nomex, and Tyvek. DuPont has also been significantly involved in the refrigerant industry, developing and producing the Freon (CFCs) series and later, more environmentally-friendly refrigerants. In the paint and pigment industry, it has created synthetic pigments and paints, such as ChromaFlair. DuPont is often successful in popularizing the brands of its material products such that their trademark names become more commonly used than the generic or chemical word(s) for the material itself. One example is �neoprene�, which was intended originally to be a trademark but quickly came into common usage. DuPont was founded in 1802 by Eleuth�re Ir�n�e du Pont, two years after he and his family left France to escape the French Revolution. The company began as a manufacturer of gunpowder, as he had noticed that the industry in North America was lagging behind Europe and saw a market for it. The company grew quickly, and by the mid nineteenth century had become the largest supplier of gunpowder to the United States military, supplying as much as half of the powder used by the Union Army during the American Civil War. DuPont also established two of the first industrial laboratories in the United States, where they began work on cellulose chemistry, lacquers and other non-explosive products. 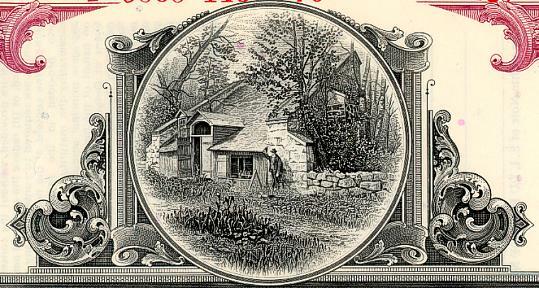 DuPont's Central Research Department was established at the Experimental Station, across the Brandywine River from the original powder mills. In 1914, Pierre S. du Pont, invested in the fledgling automobile industry, buying stock of General Motors (GM). The following year he was invited to sit on GM's board of directors and would eventually be appointed the company's chairman. The DuPont company would assist the struggling automobile company further with a $25 million purchase of GM stock. In 1920, Pierre S. du Pont was elected president of General Motors. Under du Pont's guidance, GM became the number one automobile company in the world. However, in 1957, due to DuPont's influence within GM, further action under the Clayton Antitrust Act forced the DuPont Company to divest itself of its shares of General Motors. In the 1920s DuPont continued its emphasis on materials science, hiring Wallace Carothers to work on polymers in 1928. Carothers discovered neoprene, the first synthetic rubber, the first polyester superpolymer, and, in 1935, nylon. Discovery of Lucite and Teflon followed a few years later. Throughout this period, the company continued to be a major producer of war supplies in both World War I and World War II, and played a major role in the Manhattan Project in 1943, designing, building and operating the Hanford plutonium producing plant and the Savannah River Plant in South Carolina. After the war, DuPont continued its emphasis on new materials, developing Mylar, Dacron, Orlon and Lycra in the 1950s, and Tyvek, Nomex, Qiana, Corfam and Corian in the 1960s. DuPont materials were critical to the success of the Apollo Space program. In 1981, DuPont acquired Conoco Inc., a major American oil and gas producing company that gave it a secure source of petroleum feedstocks needed for the manufacturing of many of its fiber and plastics processes. The acquisition, that made DuPont one of the top ten U.S. based petroleum and natural gas producers and refiners, came about after a bidding war with the giant distillery, Seagram Company Ltd. who would wind up as DuPont's largest single shareholder with four seats on the board of directors. On April 6, 1995, after being approached by Seagram Chief Executive Officer Edgar Bronfman, Jr., DuPont announced a deal whereby the company would buy back all the shares held by Seagram. In 1999, DuPont sold all of its Conoco shares, the business merging with Phillips Petroleum Company. That year, CEO Chad Holliday switched the company's focus towards growing DuPont chemicals from living plants rather than processing them from petroleum. Today, DuPont is a global science company with 2005 revenues of $26.6 billion, employs 60,000 people worldwide and is the 237th largest corporation in the United States. DuPont businesses are organized into the following five categories, known as marketing "platforms" - Electronic and Communication Technologies, Performance Materials, Coatings and Color Technologies, Safety and Protection, and Agriculture and Nutrition. In 2004 the company sold its textiles business to Koch Industries, losing some of its best-known brands such as Lycra (Spandex), Dacron polyester, Orlon acrylic, Antron nylon and Thermolite. R&D in India: DuPont with annual R&D budget of $1.3 billion, is setting up a research center at Hyderabad, A.P, India. This center will be operational by mid-2008. The focus of this center would be on agriculture & nutrition products.